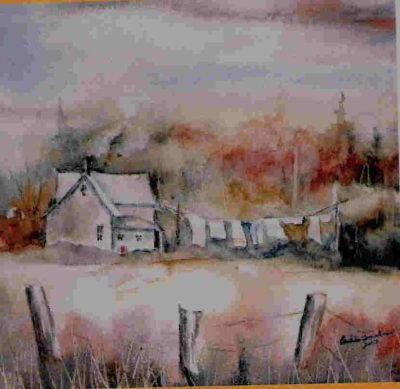 “The Pilgrims Came” by Annette Wynne. And yet it’s very strange the way We think of them Thanksgiving Day. And found a new land to be free, And built their homes quite near the sea. And journeyed many a day and night, To worship God as they thought right. The made Thanksgiving Day–that’s fun–We thank the Pilgrims every one. A few years ago we celebrated Thanksgiving with our Norwegian relatives: Oystein, Gyril, and 3 beautiful daughters. I always enjoy reading your blog and viewing the art and photographs you post. Thank you for sharing. The hermit outside of Amery sounds like an interesting fellow. Looking forward to reading more about him and his adventures. I hope you and your family had a wonderful Thanksgiving. Thank you, Carrie. Long distance hug, and I don’t hear much from readers but your comments ALWAYS give me a lift. Hope school is going well, Professor Wilhelm.